1 – User clicks/taps somewhere on the screen. 2 – The controller handles the click/tap and converts the event into an appropriate action. For example if the terrain is occupied by an enemy, an attack action is created, if it is empty terrain, then a move action is created and finally if the place where the user tapped is occupied by an obstacle, do nothing. 3 – The controller updates the robot‘s (model‘s) state accordingly. If the move action was created, then it changes the position, if the attack, then it fires. 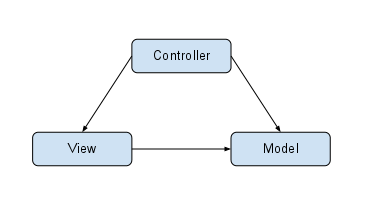 4 – The renderer (view) gets notified about the state changes and renders the world’s current state. Running the above code as an applet does nothing more than to sett up the main loop and to paint the screen black. The lines (#7-#10) contain the delegation to the update() and render() methods. Note that there is a conversion to seconds from nano seconds. It’s very useful to work in seconds as we can work with real world values. 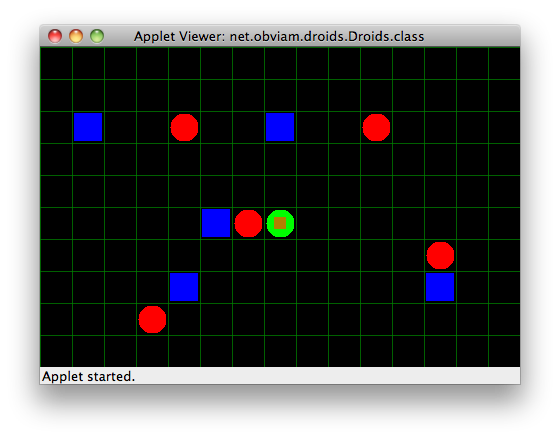 Note: Arena‘s constructor needs to be modified, so the Droid gets added to the grid before the obstacles and enemies. Lines 13 – 17 declare the Arena object and make sure that it is set when the renderer is constructed. I called it ArenaRenderer because we will render the arena (world). #22 – Declare a cell size in pixels. It is 32. It’s hard coded as in the Arena class. #23 – #28 – The grid is being drawn. It is a simple grid. First the colour is set to dark green and lines are drawn at equal distance. #31 – Set the brush color to blue. #32 – #36 – Iterate through all the obstacles in the arena and for each it draws a blue filled rectangle slightly smaller than the cell on the grid. #39 – #44 – Sets the color to red and by iterating through the enemies in the arena, it draws a circle at the respective position. #47 – #54 – Finally draws the droid as a green circle with a brown square on top. 08 – The unit represents how many pixels are in a cell which represents 1 unit in world coordinates. It’s hard-coded and not optimal but for the demo is good enough. 09 – The Arena the controller will control. It is set when the controller is constructed (line #16). 12 – The target coordinates of the click in world units. 14 – It is true when the droid is moving. This is the “move” actions’ state. Ideally this should be a stand alone class, but to demonstrate the controller and keep it concise, we’ll hack an action together inside the controller. 20 – The update method that updates the position of the droid according to the time passed at a constant speed. It is extremely simple, it checkes both X and Y positions and if they are not the same as the target position, it updates the droid’s respective position (X or Y) considering its speed. If the droid is in the target position, then the move state variable is updated completing the move action. 53-54 – Converts screen coordinates to world coordinates. #16 – Declare the controller. #28 – Instantiate the controller. #46 – Delegating the mouse up event. #60 – Call the update method on the controller. Add new actions (attack) when an enemy is clickedHint:Create a bullet entity that gets fired to the target. You can use the move action with a higher speed. When the hitpoint gets down to 0, then the enemy is destroyed. Use a different image to represent different states.